TopLife Milk for Puppies is a tasty treat made from highly digestible goats' milk that can be given daily as a treat, as well as being an important part of your puppy's diet. It contains added vitamins C & E which helps support their fragile immune system, and Taurine to maintain healthy eyes. Although puppies love milk they have a problem digesting cows' milk, and since goats' milk is nutritionally very similar to their mother's milk and easier to digest, goats' milk is the best choice for your developing puppy. Great for help younger pups with weaning and encouraging lapping by mixing with dry food. For TopLife Goat's Milk Powder for Puppies click here. Suitable for puppies aged 6 weeks and up. 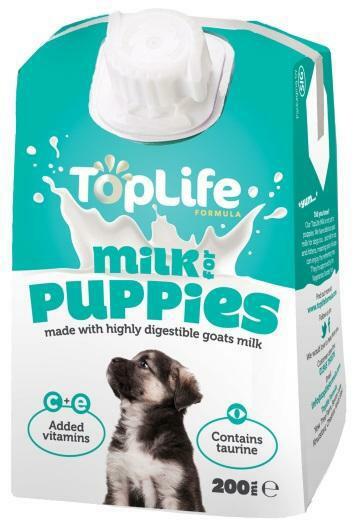 There are currently no questions for TopLife Goats' Milk for Puppies - be the first to ask one!